Capriccio showing the interior of an oval building with aedicular doorway with sculpture on the pediment and columns on either side. Semi-circular windows are on the cornice of the vaulted dome, with similar pattern on the floor. 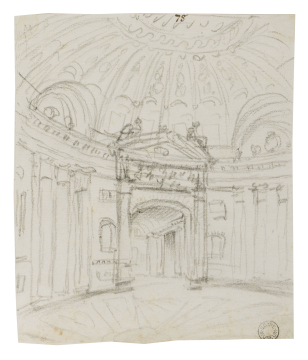 You are here: CollectionsOnline / Capriccio showing the interior of an oval building with aedicular doorway with sculpture on the pediment and columns on either side. Semi-circular windows are on the cornice of the vaulted dome, with similar pattern on the floor. The composition is probably based on the interior of the oval and domed church of San Andrea al Quirinale in Rome by Giovanni Lorenzo Bernini (1598-1680). Other related exercises can be seen in Adam vol.55/80 and in the Pantheon style found in 55/118 and 147. San Andrea was well illustrated in G. G. de Rossi, Insignium Romae Templorum Prospectus Exteriores Interioresque, Rome, 1684, pls.23-25, which was acquired by John Soane at the Adam sale of 1818 as lot 148 (see Catalogue of A Valuable Collection of Antique Sculpture etc. R. Adam, Christie's, London 21 & 22 May 1818).The chalk plan on the verso of Adam vol.55/81 may be the source for this scheme.